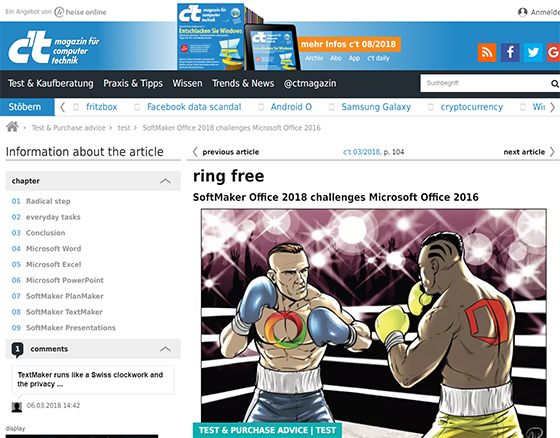 The below SoftMaker Office 2018 review was written by Dieter Brors and Dorothee Wiegand for c’t Magazine in Germany earlier this year. TextMaker 2018 handles even large documents containing hundreds of pages splendidly: loading, scrolling, browsing, saving – all of this works smoothly without any delay, while Microsoft Word always lags a bit with documents of this size. The sidebar is useful when editing large documents. It displays selected document elements, such as all headings, images, footnotes, comments or bookmarks. […] The sidebar is much more powerful than the Word navigation pane, which only lists headings. TextMaker reads and writes files in Word and OpenDocument formats and delivers particularly convincing results with the Microsoft format: In our tests, Word documents could be saved without losses or layout changes. Learn mode about SoftMaker Office 2018 and download free 30 days trial here.